Fall is in full force, and the colors are beautiful. Since the weather was so wonderful, there have been several garage sales in the neighborhood. Our neighbor, just four houses down had one last weekend. The kids were begging me to let them go, but I kept putting them off. Then I laid down to take a nap. Scout came up after I had fallen asleep and asked in a whisper if they could go. “Awrghth” is what I muttered in my sleepy state. Apparently that translated into, “Sure kiddos, so ahead,” because a little later I was awakened with another lispy, tickley, whisper in my ear. “Mommi, we got you a surpwise but I’m noooot going to tell you what it is but you can have one of the surpwises if you come to the kitchen,” said Eloise. The kiddos had raided their money jars and had headed down to the garage sale. They hadn’t bought a single thing for themselves, it was all for Mommi. This is a photo of what they bought. Being a Mommi for 11 years gave me the right words, smiles, hugs, and thank-yous, but what am I going to do with a 3-D-moving picture of “The Last Supper”? 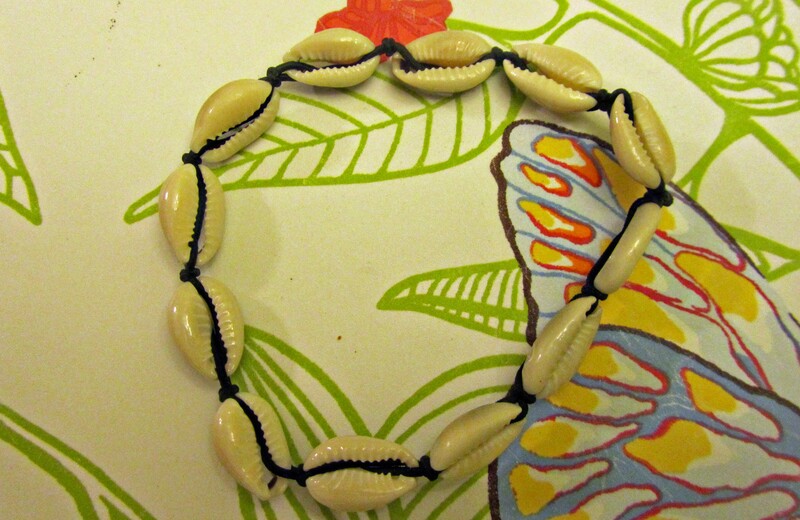 The bracelet, I wore with my Sunday-Go-To-Meeting-Outfit. 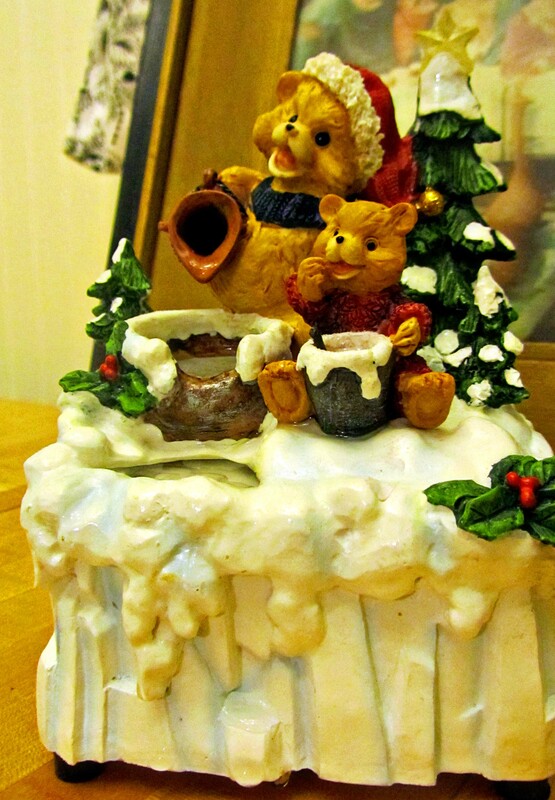 The Christmas fountain has sat on my kitchen counter all week flowing water and good Christmas cheer. I skimmed the Diabetic Cookbook, but didn’t find any recipe I would use. I burned the two candles several times this week, then tucked them away in the “In Case Of a Power Outage Box” in the basement. 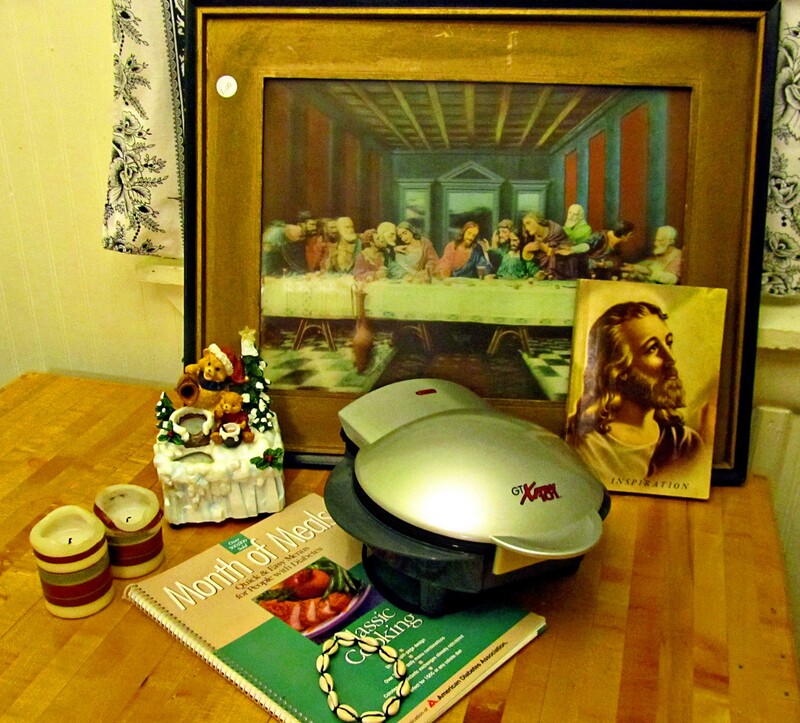 But the egg encrusted electric omelet maker? . . . hmmmmm. . . 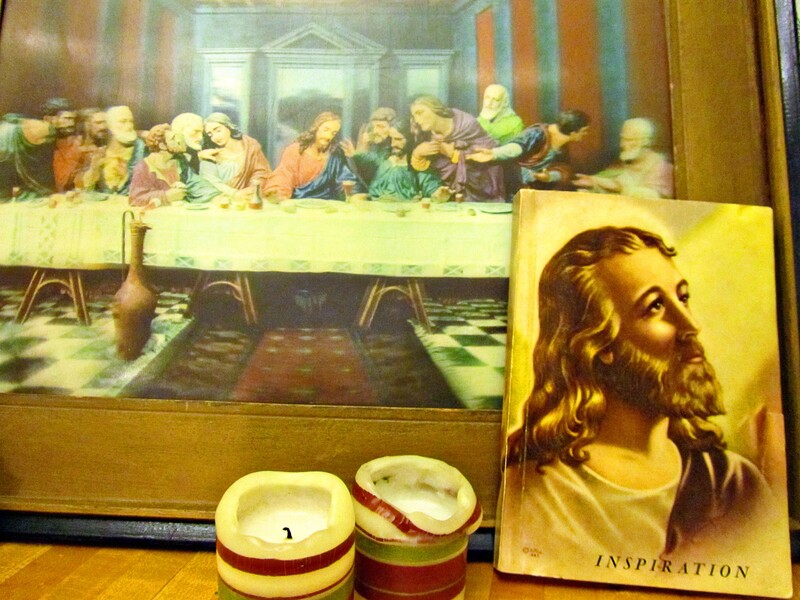 But the gift that really is confusing me is the 3-D moving, framed, image of “The Last Supper.” The kids were particularly pleased with this gift. Incidently, I had it propped up on the floor, and Little Man would stick his face quite closes and sway back-and-forth to make the picture move. The hymnbook might be usable. 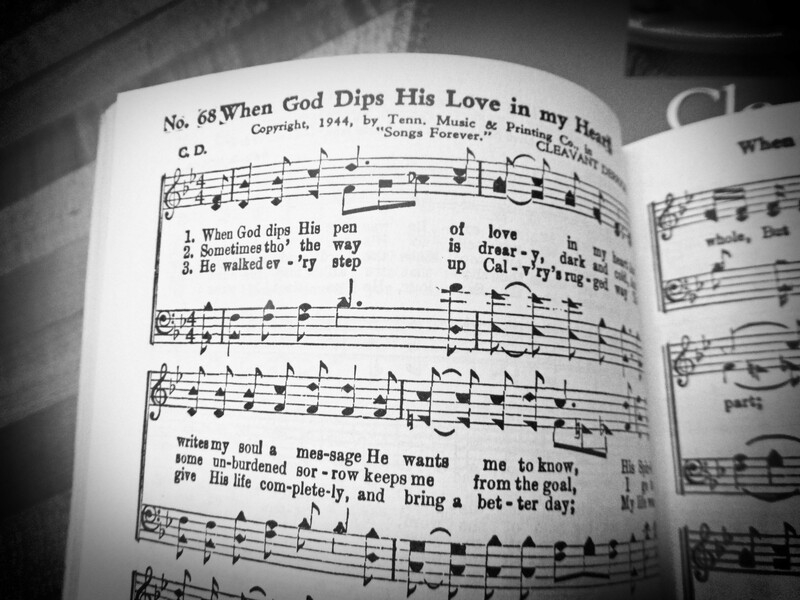 I love learning new hymns or just having all the verses to hymns that I hear on the Hunni’s Bluegrass CD’s. This Sunday as I was sitting down to worship, I began thinking how similar the well intended gifts my kiddos gave me are like the gifts I give my SAVIOUR–gifts that perhaps I like, but are they what HE wants? I can only think of a few requests that the LORD mentions. Things (gifts) HE desired. When I was in grade school for a Christmas Program, I sang the following song. What shall I give HIM–poor as I am? If I were a shepherd I would bring a lamb. If I were a Wise Man, I would do my part. But what shall I give HIM? Give HIM my heart. HE desires my heart–not necessarily my money, my time, my talents, my services. . .but my heart. That is his request. His desire. P.S. Feel free to add anything in the comments section. Anything…… Tough to appreciate those “presents”, except as loving gifts from your children.